It was June of 1992. The location was Rio de Janeiro. The occasion was the world conference on environment and development. A large number of people had come out on the streets. They were protesting the arrival of George Bush senior, the then president of the US. Just before coming to the conference, Bush had visited a local shopping centre, urging people to buy more so that the increased consumption could rescue his country from financial crisis. Protesters were angered by his statement that “the American lifestyle is not negotiable”. People wanted change in the way the world did business with the environment. They demanded that Bush should sign the climate convention and agree to tough emission reductions. The mood was expectant, upbeat and pushy. For the first time environmental issues were put on the world table. Till Rio 1992, environment was considered a local or national issue. But science and fears of a changing climate altered all that. Emission limits were needed for all industrialised countries. For this, global rules were essential and global cooperation imperative. The Rio conference saw the birth of global conventions on climate change, biodiversity and desertification. Inevitably, Rio 1992 witnessed the first showdown between the North and the South on global rules for environmental management. Developing countries were firm they needed ecological space to grow. But they were also willing to say they should grow differently so that they do not add to pollution. They wanted money and technology to secure the new growth strategy. The big take home was that the environment was about socially equitable development. Now 20 years later, world leaders will meet again in the same city of Rio de Janeiro. But this time there is no apparent excitement in the run up to the conference. It seems world leaders, lost in managing financial crisis, have no time for environmental issues. It seems the world has run out of ideas to safeguard a common future. So, the conference is ridden with the usual polemics. The old rich, mostly European countries, are preaching the virtues of environment to the new rich, comprising India, China, Brazil and the rest. The new rich are resisting efforts to remove the differentiation in the contribution of different countries to the creation of the problem. They want their right to development secured. But now the old rich want to wriggle out of this differentiation. They want action from all. They are missionaries for the environment. The rest, they project, are renegades. The question is what more can be done at the global level? The fact is that all global environmental problems—from climate change to hazardous waste—have separate agreements. International rules of engagement and cooperation are being discussed in parallel processes and institutions. So what can a conference like Rio achieve? A new bogey was created: Rio+20 would be about green economy and not about the 1992’s concept of sustainable development. But this was said without clarifying what is true green economy? Does it mean the world will invest in technologies to green the current economy? 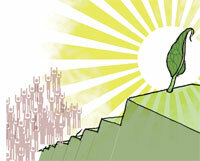 Or will it seriously reinvent growth so that it is not driven by cheap consumption that is costing us the earth? The question is too inconvenient, so, instead, negotiators drew up a list of actions to meet green targets called sustainable development goals. Thus the fight has shifted to a new goal. The European Union proposed a set of environmental targets—from renewable energy to forest and biodiversity. The G-77 proposed a counter set of development goals—from consumption patterns to poverty eradication. At Rio 2012, the fight will be about whose goal makes it to the priority list. Rio 2012 will most probably set up a process to negotiate the specifics of the sustainable development goals. The fight will be postponed for another day. In all this nobody is asking why the world remains so deeply divided over the definition of environment. The fact is the world has changed since 1992. The fact also is that the developing world has by now seen the pain of environmental mismanagement. There is proactive national action. It is not as if countries like India must be converted to environmentalism. They understand the need for action. They are working to fix environmental problems. But they find that like much of the already rich world they remain behind the problem; they fix something, but much more gets out of control. The bottom line is that environmental concern and action at the national and the local level has blossomed since 1992. But when countries meet at the global level distrust prevails. Environmental issues are divisive because the already rich have reneged on their commitments to secure growth for all. Now they want to start afresh to build a new world. But this is not the commitment that will give us back the earth. The hard truth is that unless the world sorts out its deep divisions, global action will be weak and meaningless. So instead of focusing on things we cannot do, Rio 2012 should celebrate, loudly and boldly, that people (and nations) are not waiting for global consensus to emerge. They have taken matters in their hands. They are committed to change—change we can believe in. The international regimes, from Rio+20 at one end of the spectrum to the WTO at the other, remain based on a premise that undermines attempts at collective action. In these arenas, nations are still competing with each other. China and India wish to secure their right to development. The U.S. and Europe wish to see Ã”Ã‡Â£common but differentiated responsibilitiesÃ”Ã‡Ã˜ thrown out. This is the "usual polemics" as you rightly suggest. The usual, nationalist, polemics. Perhaps that's because the underlying motivation remains "usual" as well. Nations fundamentally look out for their national interests, a position that hasn't changed since Stockholm. Of course, we can (and should) argue that the global environment is a national interest for each individual nation. Problems of global commons exploitation, degradation of common heritage, vanishing biodiversity, transnational pollution, etc. all have national level impacts. But when environmental problems -- even these global ones -- remain framed as national interests, they will accordingly be stacked up against (if not subordinate to) other national interests such as GDP growth rate, debt service, infrastructure, capital accounts, corruption, political harmony and so on. I would argue that even one of the greatest (if now fleeting) successes of global environmental cooperation, the Montreal Protocol, was largely the product of briefly aligned national interests, rather than any urgent, international belief that the world would be a better place if everyone were protected from the side effects of degrading ozone. As long as the environment remains a negotiable item for individual nations Ã”Ã‡Ã¶ as long as it is on the ledger with a laundry list of other national concerns Ã”Ã‡Ã¶ any forum on "sustainable development goals" or green accounting or the like will simply be an arena for negotiators to angle for the best outcome for their governments and corporations and (occasionally) citizens. To me, thatÃ”Ã‡Ã–s hardly a recipe for international, collective action. I don't see how that can achieve lasting change. It can be easily seen that common people living in the poor countries are more concerned about environment. Neither the rich countries nor the rich in other parts of the world, including those in the poor countries are least concerned about environment. They lead their life as usual with all sorts of extravaganza and wastage. We can observe it day in and day out. For example, the rich go on buying big cars, SUVs, MUVs etc. without being concerned of the environmental degradation they cause. Probably they think that they can purchase safe environment just like bottled 'water'. Yes you have analysed before they begin. Let us wait and see to opine further. Certainly we expect positive actions. Gross distortions are so glaringly apparent that these leaders must have come to a thumping agreement immediately preventive actions to remedy them. Infinite deficits in finances generated by false foundations of modern ways of living like nuclear power programmes which generate insurmountable energy debts and catastrophes resulting, yes, in extinction and unacceptable illth and filth must be abandoned now. This destroyer of generations of life must have seen condemnation in the strongest terms. These leaders are useless for the future of a healthy wholesome future. With these we are doomed. Environment knows no boundries.National solutions are self centred.Environment and climate is not a commodity.It is a part of our body.We cannot sell our parts.Its unethical .Water is free itÃ”Ã‡Ã–s the transport that puts a cost on it.Air is free but when you purchase a house on 100th floor you buy good air automatically.The new competition is how to escape climate change and a deteriorated environment.Its easy: purchase an Island in atlantic or pacific.Or secure your place on another planet.The rich have no nationality,religion or caste.They buy good life and leave the rest for others to sort out.Conferences are for intellectuals and people of science to deliberate on matters on which they have least control.Rich nations just observe and subvert the issues.Only International law can bale us out.Its Technocommercial Vs Sociolegal.But the show goes on.Why blame it on Rio? All the best for all participants! !